FREE delivery to United Kingdom in 6 - 11 working days. A simple but striking cluster of three decorative pendants in fine-grained Carrara or fine-polished Nero Marquina marble. British designer Terence Woodgate has launched Core, a new collection from his eponymous lighting company. Offering a refined and elegant silhouette with a slim conical body, Core is crafted from Carrara or Nero Marquina Marble, with a warm glow created around the base of the Carrara pendant when lit. Core utilises highly efficient LED technology and the lamp holder is entirely enclosed and invisible. 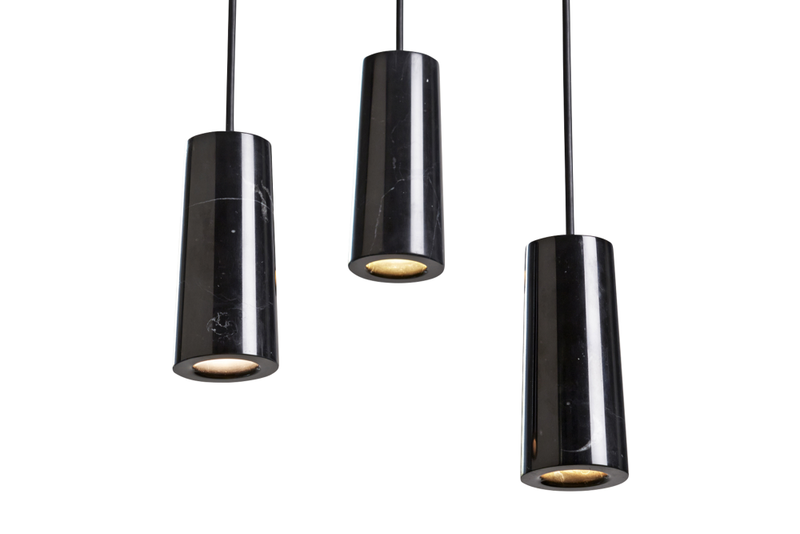 Designed to cater for both the residential and contract markets, Core pendants are available individually or in clusters of three and six. Terence Woodgate comments: Core is a simple pendant but particularly striking when arranged in clusters or groups. The collection uses Carrara and Nero Marquina marble, materials Ive chosen for their pleasing, tactile quality and timeless appeal. Our aim is to create exceptional lighting, by designing and engineering innovative products that are relevant, ultra-efficient and beautiful.